Just as culture and knowledge can be transmitted from parent to child, or from generation to generation, the impacts of trauma can be as well (Bombay, Matheson & Anisman, 2009, p.7). However, only in the last decade or so has intergenerational trauma, or trauma that is transmitted from generation to generation, been put forth by researchers as a possible explanation, or strong contributing factor, for the multiple social issues and inequities that are experienced by many Indigenous peoples in countries such as Canada and Australia (Menzies, 2008, p.41). In order to understand what is intergenerational trauma, an understanding of the definition of psychological trauma is helpful. Psychological trauma can be defined as the “effects of overwhelming and extraordinary experiences that leave their victims in a state of helplessness and thereby undermine their sense of personal efficacy, their relational capacity, and their ability to psychologically integrate the upheavals of life in meaningful ways” (Doucet & Rovers, 2010, p.94). Experiences of such trauma can change an individual’s perceptions about life, their senses of self and self-worth, as well as their overall worldview and can instill feelings of dread, fear, depression, anxiety, shame and anger that last far beyond the actual lived experience of the trauma (Doucet & Rovers, 2010, p.94; Ringel, 2005, p.434). What is significant about intergenerational trauma is that the impacts of traumatic experiences can have implications far beyond the people that personally suffered through them and can affect generations to come. How is Trauma Transmitted from Generation to Generation? Intergenerational trauma can be transmitted from a parent to their child through various ways. A child may vicariously identify with their parents’ experiences of trauma or a child may assume a sense of responsibility in trying to compensate for their parents’ traumatic experiences (Doucet & Rovers, 2010, p.95). For example, a child may try and take on the role of parent if their parent neglects the child as they are occupied with their own unresolved issues stemming from trauma (Doucet & Rovers, 2010, p.97). Trauma may also be transmitted through the ways a parent communicates their traumatic experiences to their child or through the parenting styles used by parents (Doucet & Rovers, 2010, p.96). For example, it has been suggested that Indigenous parents who were deprived of proper parenting models while segregated from their families as children then lack the necessary knowledge and skills to properly parent their own children (Menzies, 2007, p.373). Also, it has been approximated that maltreatment of children occurs in roughly 30 percent of those whose parents had also been maltreated which is significant as many of the Indigenous children who survived their forced removals were exposed to parenting models that were based on abuse, coercion and severe punishment (Bombay, Matheson & Anisman, 2009, p.17; Menzies, 2007, p.373). 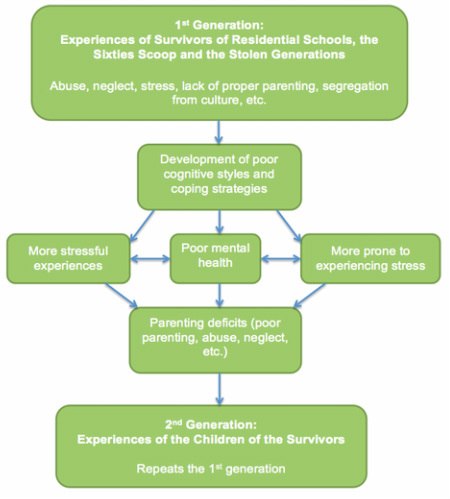 This flowchart illustrates how intergenerational trauma may connect the traumas experienced by the survivors of residential schools, the Sixties Scoop and the Stolen Generations with the experiences of the children of those survivors. 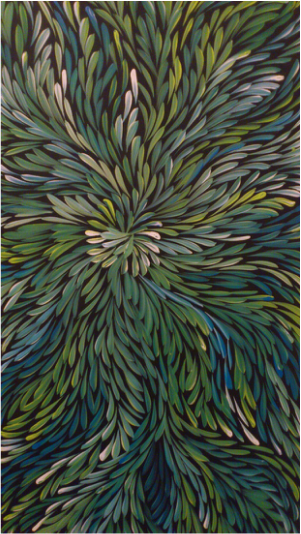 For example, as a child of the Stolen Generations, taken from her community and placed in an institution, the child was separated from her parents and hence did not benefit from proper parenting and may have been disciplined through physical abuse by the institution care providers instead. That child may then not have developed basic coping skills that would equip her to effectively handle stressful experiences which would lead to poor mental health and poor parenting skills. Because the child herself did not receiving proper parenting as she was segregated from her family, she does not know how to properly parent her own child later in life as an adult and may even resort to physical abuse as a disciplinary method as modelled after those who disciplined her back in the institution. As such, her child will then suffer as well.